Summer is here and so is the Salt Lake City Downtown Farmers market for its’ 27th season! 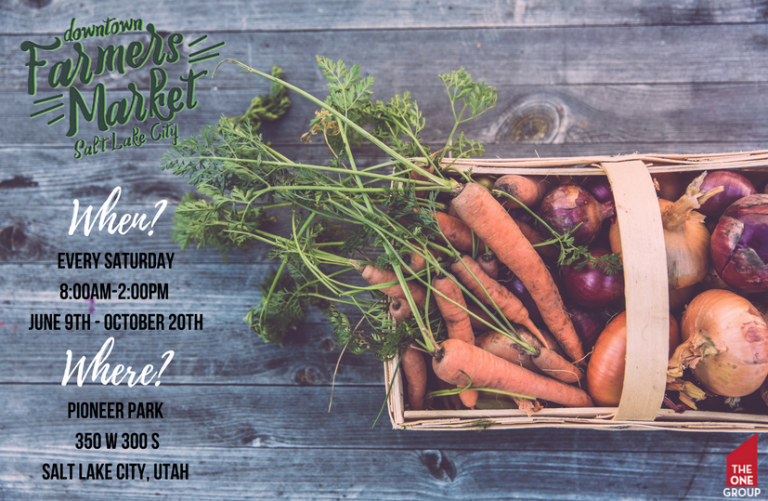 This farmers market was founded to support and strengthen the small local farms and businesses around the Salt Lake Valley. The farmers and producers offer the freshest local fruits, vegetables and so much more! You’ll be able to find a large variety of grass fed meat, eggs, dairy, honey and flowers. Don’t forget about all the locally made breads, baked goods, sauces, spreads, and more! Every Saturday from 8:00 am-2:00 pm June 9th through October 20th. The Gateway: FREE PARKING! First hour is free and validations for extra hours can be picked up at any market ‘info’ booth. The market also offers a FREE valet service so you don’t have to lug all your purchases back to your car. Fruit and Veggie Valet: The market has a special produce loading zone on 300 S., near the center of the block. Leave your purchases in our veggie valet, then go get your car. 400 West: The 400 W perimeter of the park is turned into angled parking. Vehicles must be moved by 3:00 pm.